Model Amber Rose has a theory: She believes that "Becky with the good hair" — Jay-Z's rumored mistress that Beyoncé had alluded to in her 2016 track "Sorry" — was none other than Shakespeare in Love actress and Goop founder Gwyneth Paltrow. During an interview on Make Speidi Famous Again, a podcast hosted by The Hills alums Heidi Montag and Spencer Pratt, Rose shared, "I definitely think Gwyneth Paltrow is, like, 'Becky with the good hair.'" She added, "I really feel like she's … I feel like she's the one that was, like, f***ing Jay-Z." So, what's fueling Rose's ideas about a secret Gwyneth Paltrow-Shawn Carter tryst? Well, she explained that Paltrow and Beyoncé once enjoyed a public friendship. But, in recent years, the two celebrities haven't appeared to spend time together. "They were, like, friends, and then, like, you don't see Gwyneth Paltrow with Beyoncé anymore," Rose stated. "And now Gwyneth lost her husband, but, like, Beyoncé's still with Jay." Though she admitted that she doesn't actually know if Paltrow and Jay-Z ever had an affair, Rose noted, "I'm surprised no one thought of that." 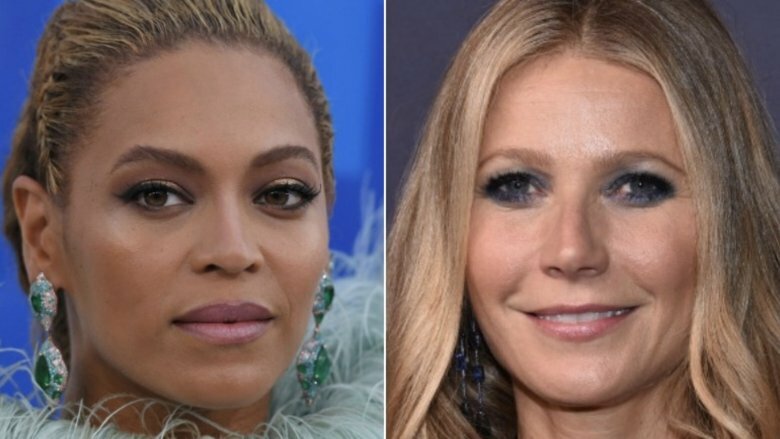 While we can't speak for what get-togethers Paltrow and Beyoncé may have or not have behind closed doors, Rose is correct when she says that the pair of influential A-listers did appear to boast a close relationship in the past, and that they haven't hit red carpet-worthy events together for some time. As Paltrow shared with Ellen DeGeneres on the comedian's talk show in 2010, she and Beyoncé met at a charity event sometime in the 2000s. "We just kind of hooked up and became really close," Paltrow said. She added of Beyoncé and Carter as a couple: "they're incredible people. They're very, very kind, generous, good, good people." What followed were joint international trips with their famous husbands (Paltrow was married to Coldplay frontman Chris Martin until their "conscious uncoupling" in 2014) and hangouts at their spouses' concerts. In 2013, Beyoncé called Paltrow "incredible," adding that "she's a great friend on every level" (via E! News). While there's no evidence to suggest that Paltrow and Beyoncé have grown distant over the years, they certainly haven't been seen much together in public. So, could Rose's theory hold water? Well, it's possible…but there are just no available facts to back up her assertion. Plus, there have been several suspects in the case of "which Becky has the best hair." After Beyoncé sang, "He only want me when I'm not there / He better call Becky with the good hair," on her mega-hit album Lemonade, some fans thought that pop singer Rita Ora or superstar Rihanna may have been Jay-Z's mistress (via People). However, many more believed that "Becky" was none other than fashion designer Rachel Roy — the ex-wife of Jay-Z's former partner Damon Dash, a man with whom the "Empire State of Mind" rapper had had beef. Besides Jay-Z and Roy's allegedly close friendship — Beyoncé's sister, Solange, reportedly argued with her brother-in-law about his relationship with Roy in their infamous elevator fight — Roy had also hinted that she was "Becky" when she posted a photo of herself with friends on Instagram after Lemonade was released. In the post's caption, she wrote, "Good hair don't care, but we will take good lighting, for selfies, or self truths, always. Live in the light #nodramaqueens" (via The Daily Beast). However, Roy later seemed to deny she was "Becky," stating, "I want to put the speculation and rumors to rest. My Instagram post was meant to be fun and lighthearted, it was misunderstood as something other than that" (via People). She added, "There is no validity to the idea that the song references me personally. There is no truth to the rumors." So, could Gwyneth Paltrow actually be "Becky?" Well, according to Paltrow's rep, the answer is a big fat no. "The whole story is completely absurd and 100 percent false," the actress' spokesperson told Entertainment Tonight. Still, we just can't help but wonder why Paltrow and Beyoncé are rarely seen together these days. Hopefully, Paltrow will soon prove her friendship with Beyoncé by inviting both the singer and Jay-Z to her wedding to American Horror Story producer Brad Falchuk. That'd certainly convince us that Paltrow is absolutely not "Becky."